Thanks for your interest in Adrenaline Barbecue products! Below is some additional information about placing your order with us and where to find US and international retailers. Place your order here on our website. All orders received by 3pm Eastern time Monday – Friday will ship the same day. We are excited to offer our customers free Ground/Home Delivery shipping on every order. 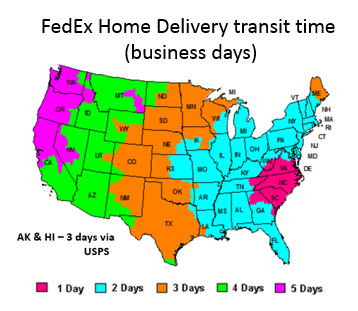 Transit times to all US locations are indicated in the map below. For eligible customers in the 3-, 4- , or 5-day window, you can upgrade shipping to FedEx Express 2Day service for a flat rate $10. Thermometer-only orders will ship with USPS Priority Mail 2-3 Day service. Visit a local retailer. We are connecting with local barbecue shops around the country to offer our product. As we sign up more retail partners we will add them to this list. Please note: shipping quotes provided on our site are for transportation only. Any additional charges related to the import of your shipment (including, but not limited to duty, taxes, tariffs, customs clearance fees) are not included and are the responsibility of the purchaser. Dickson Barbeque Centre retail locations in Toronto or online at their webstore for shipping throughout Canada. Direct ship via purchase on our website. Please visit the shopping cart “Calculate Shipping” section to see shipping costs. UK: Slow ‘N Sear 2.0 and many other ABC products are now available from Totally BBQ and BBQ & Smoke. Germany: Starbridge (online and in the Furth retail location) stocks many of our products and ships throughout Europe. Sweden: American Stuff stocks Slow ‘N Sear for 57/67cm kettles and some accessories. Shipping throughout Scandinavia! We also direct ship to Europe and the UK. Please visit the shopping cart and enter your location details in the “Calculate Shipping” box to see shipping options to your location. Note: our products have been confirmed not to be affected by recent international tariffs. Customers in Australia: please visit our Australian retailer Urban Griller. Or place your order on our website. Shipping costs can be found in the shopping cart – scroll down to “Calculate Shipping” and enter your location details to see shipping options. Customers in New Zealand: please visit our New Zealand retailer Mavericks Group. Or place your order on our website. Shipping costs can be found in the shopping cart – scroll down to “Calculate Shipping” and enter your location details to see shipping options. Customers in all other countries: if you do not see shipping options to your country in our shopping cart, please contact us at info@abcbarbecue.com for a shipping quote.